You may have noticed the headlines in today's Boston Globe business section about the Aquarium's research on lobster shell disease. 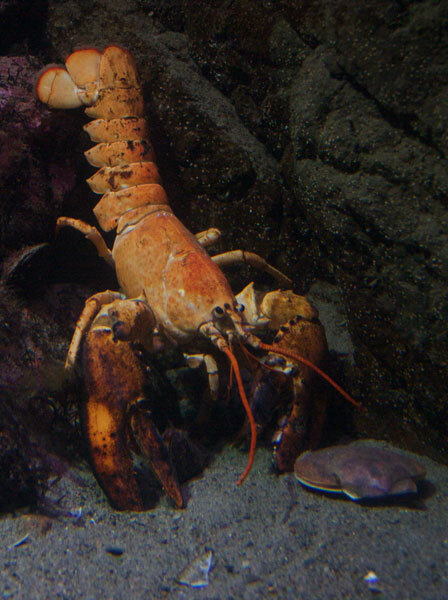 The disease is caused by bacteria that settles on a lobster’s shell, and it can have major impacts on the lobster fishery. See an example of lobster shell disease and link through to the full article via the Globe's Tumblr post about the story. Michael Tlusty, Ph.D., and other scientists at the Aquarium's Lobster Lab are finding that shell disease occurs among American lobsters in warmer waters off Rhode Island, Connecticut and New York. While the disease is not usually lethal to the lobster and it does not appear to affect the meat, it does impact the lobster fisheries. That's because diners expect a smooth, red shell when they order lobster, not mottled and scaly shell. In addition to shell disease, Aquarium researchers are also looking into lobster nutrition, brain development and shell colors. If you are intrigued by the many variations of lobster shell colors, like orange and blue lobsters on display in the Gulf of Maine exhibit, check out these Exhibit Blog posts on a calico lobster and a two-tone lobster that live at the Aquarium!